The mission of INCOMING! is to spotlight our military and honor currently serving troops, retired military and veterans of all services. Without these men and women our way of life would be much different. There is no continuing plot or story line here. 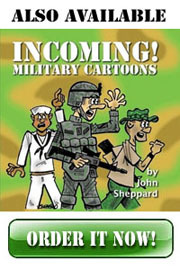 It is a series of single panel cartoons, sometimes depicting serving troops, sometimes their families and other time former service members. Fun is poked al all the branches with no harm intended. Combat troops as well as rear echelon types (REMFs) are highlighted and share the spotlight as well. Twice a week (Tuesdays and Fridays) we’ll pop smoke and bring in a replenishment chopper containing a new cartoon. So come back often and check out the new updates. 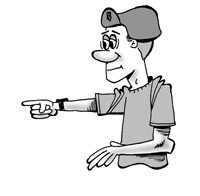 INCOMING currently appears on the web at this web site and the web site of Popular Military magazine. 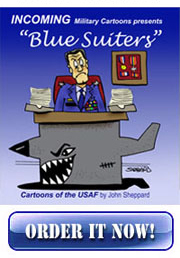 It appeared in Purple Heart magazine for 3 years and periodically INCOMING cartoons appear in Leatherneck magazine. 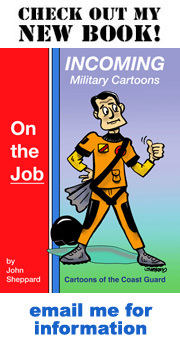 An INCOMING cartoon has even appeared in Pegasus, the magazine of the 82nd Airborne Brigade in Afghanistan!